Fruit; above medium size, roundish. Skin; yellow, streaked with red and bright crimson next the sun. A beautiful apple, for culinary use. The tree is very ornamental when in flower, owing to its large, brightly coloured blossoms. [Proc. RHS 1862-1865]. ‘A very pretty, but very useless apple, fit only for kitchen use, and then only of second-rate quality; it is in season from November to February.’ [Hogg p.127/1851]. ‘Striped Holland Pippin’ is figured in Pomona Brittanica [PB pl.90/1812]. 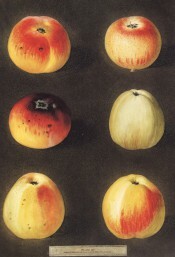 ‘Striped Holland Pippin’ is the apple at top left. Listed in the 1850 and 1857 catalogues [Apple no.40/1850]. ‘Holland’ was incorrectly spelled ‘Bollond’ in the 1850 catalogue.